“This is Peter Pan’s Playground. Before the war there was a pierrot show there and the rest of the site was a bowling green. After the war of course the bowling green had disappeared and it became the Peter Pan’s playground. I’m in my twentys and what stands in place of the old Peter Pan’s is really disappointing. I never had a chance to visit it in its good years and wish that I could have seen it in all its glory. A memory of Peter Pan’s was when we were taken on a crocodile walk from the Convent to the prom and we ran off down to the playground. I think one of the girl’s uncles worked there. It didn’t impress the nuns! Mick, did Mickey George go to St. John the Baptist School at Woodingdean? Do you know, I’m sure the Micheal George we had there went to Australia. You seem to know all the haunts I did when I was young. I was so pleased to find this website with guidance from the kindness of Mick Pierson of Bennet Road where we used to live. I spent many hours from the age of 5 traipsing back and forth with bags of dress ups to sing and dance at Peter Pan’s Playground and was often a winner of the prized lollipops. I did go to Australia and actually become a professional singer, and so the playground was a special dreaming place for me. I live in Melbourne but have such fond memories of Peter Pans. I am so sorry to say I was scared of you Mick, great to be in contact, Linda. Does anyone know where I can find a picture of the Big Apple ride that used to be in Peter Pans Playground? I have very fond memories of it as a child and there are absolutely no pictures of this ride anywhere despite the fact it was only pulled down a few years ago. Hi, as a child I went to a playground with a miniature replica castle for kids to play in, complete with a dungeon. This would have been in the 1970s. I’ve never been back there and wish I could remember for sure where it was. It’s been suggested it may have been Peter Pans Playground in Worthing? Anyone able to confirm this – or not? I would love to take my kids there. I remember Peter Pan’s playground very well as a kid in the late 1970s and most of the 80s, I used to go to Brighton at least two or three times a year and the rides they had were all good and in the 80s there were always new rides coming each year. My favourite was always the big wheel though, I think it remained there until about 1993. I would like to ask anyone if they have any photos of the playground when the big wheel was there, any help would be appreciated. I was too young to think about taking any photos at the time! Didn’t the Heale family own Peter Pans? If I remember they ran it with a fist of iron and as kids we found them quite scary. Whatever happened to the Heales? Yep the Heal family owned Peter Pans playground from the late 50s until it the late 80s – in fact back in the day the Heals owned most of the amusement arcades in the town too. Jimmy Heal was my step father and so I spent many a school summer holidays down at PP’s, riding on Volks railway and swimming at nearby Black Rock and in the very early days I would visit the Aquarium to see the Dolphins. I’m 46 now and it all seems like only yesterday- there used to be a stage in the playground at the end of Peter Pans, where ‘uncle Jack’ would have us all singing and even dancing on stage. I think the song of the day was chirpee chirpee cheep cheep Lol – those were the days – trust me the Heals were nowhere near as scarey as they looked, but did run the place with a fist of iron, but then there was never any accidents or trouble down there, so it pays off. My grandad ran the miniature petrol driven vehicles at Peter Pan’s – my favourites were the pretty much perfect replicas of Southdown Coaches in green and cream livery that you could sit in and ride. Even the number plates (which had to be short numbers to fit) were real ones. I seem to remember KP1 (my mum’s initials) which he sold to the council for the mayoral limo. I used to sing on the stage and get a lolly from ‘Uncle Jack’ – he always dressed in white and had a moustache, which was huge. He used to sing to me “If you knew Susie like I knew Susie, Oh, Oh, Oh what a girl.” Wow I loved it there; do you remember the old rides? I enjoyed going on Volk’s Railway. And swimming at Black Rock Pool was fantastic. I am so pleased you all remember the ‘old days’ as I do, great to share and keep them always. What lovely memories, as a child I spent many days playing at Peter Pan’s. Every summer my father, Micky Deakin, used to paint the playground, including the railings around the caterpillar ride, it would be lovely to see a photo. Earlier memories, going back to the 1970s include the bumpy slide. you would be given a sack to ride in, simaliar to the ones used on the helter skelter on the Palace Pier. It was great fun running up the steps at the side of the slide to have another go. The ladybug ride was another favourite. Does anyone remember the name of the amusement arcade? I think it was Penny Wonderland or Penny Arcade, would love to see a picture if anyone has one? Wow! I guess, as the years go by, I am becoming more and more nostalgic and anxious to learn all I can about my heritage. My grandfather was the John Maxwell who started Peter Pan’s Playground. I had no idea JM Barrie was a friend of his but I am not surprised as he seemed to have a gift for attracting interesting and gifted people. 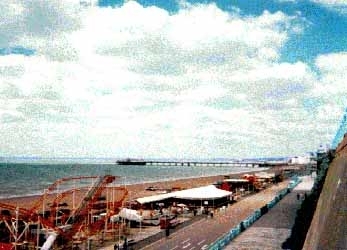 There were PPP’s at several seaside resorts around the British Isles plus other enterprises such as the Forest Gate Roller Skating Rink and boating rights to all the Royal Parks in London. Also Tussaudes and Maxwell’s Waxworks one of which was in Brighton under the managership of my (adopted) uncle Cyril Tussaude. The manager of PPP Brighton was Norman White (uncle Norman). Norman was a large man and Cyril quite small and I remember they had a party piece where Norman played the ventriloquist and Cyril the dummy. Grandpa also had the boating rights on the Hove Lagoon. On my grandfather’s death, my father Jack (christened John) took over as MD of the companies but, unfortunately, he lacked the entrepreneurship of his father and by the mid sixties the companies were in rather poor shape with nothing left for yours truly to become involved with. Great site and marvellous stories, thank you! I had a look at Bing maps (http://www.bing.com/maps/) and it still has the Big Apple ride on its aerial (satellite) view of Peter Pan’s. You can’t zoom in that close but there’s no mistaking it – enjoy those trips down memory lane before Bing updates its pictures! In approx 1974/5 I worked in the snack bar at Peter Pan’s, during school holidays. It was great fun and I was really looked after by the owners. I remember clearly some of the lads who worked on the rides & bumper cars, lived underneath the back kiosks, in what can only be called as little boxes! I lived in Kemptown, so it was only about a 15 mins walk to get to the beach front. I have just celebrated my 50th birthday, but clearly remember those days. Funny, the sun seemed to always be shining then!! Nobody has mentioned the roller rink, that’s the only reason I went there. In the late 50s and early 60s I was always there. Then I moved on to ice skating on West Street. I took my son there in the 70s but I think the roller rink had gone by then. I was hoping for 1950’s photos of Peter Pan’s. I too used to go there but like Anne Newman, just for the roller skating. I went every Saturday morning for 6d until I graduated to ice skating at West Street. Hired boots, no lessons, little money in those days. Does anyone remember an animal train starting with two big elephants and then other animals in pairs going along rails? I have a picture of my sister and I on top of the first elephant. My brother David Mitten used to work on the waltzer at Peter Pan’s early 80s, with Dave Norris and a guy they called Spider! He used to walk up the big wheel. Hi Joyce, I remember Dave very well. Dave Norris, Dave the big wheel operator, Mick and Colin Day, Keith Thomas, Maria and Linda, who worked for Bill, Snaky and many more. I used to work on the darts stall for Tony Waddington (Wombat). I remember many a night watching the dodgems sitting in the box with either Mr Brown or Albert Heal…they were the days. Hi Martin. I used to work with you and your brother Richard on the darts stall? Being a late 80’s kid I used to go there (I assume) right before it shut. It was the first place to get Mortal Kombat II, so the arcade was open until at least summer 1993. The beginning of the end for Brighton’s arcade scene, ending with the closure of West Street Family Leisure in 2011. Fond memories of the Big Apple ride too. Sad times! Hi my hubby worked at Peter Pans as well, his name is Tony Bates. He worked on all the rides. Does anyone remember him? Hi Julie, I remember Tony and his brother Andy. I worked in the snack bar, on the rifles and darts. I used to work in the food stand, ghost train and ice cream bit. Loved it and miss it loads. The Big Apple can be found at Bunn Leisure, Selsey. I worked there up till the day they closed, think I did everything from cafe,rides and arcade. Some good memories. I remember the ride with the two elephants followed by other animals. Those days somehow become more vivid. Suprisingly so, as I would have only been about 6 or 7 in 1953. Brandy snaps and cockles on Palace pier. The ghost train at the end of the pier on the left and the glass blowing man making glass animals at the entrance to the dance hall. Loved those sunny carefree days.